Eminem stans, it’s that time of year again. The great Marshall Mathers celebrates his 40th birthday today (October 17). Unless you’re in Em’s inner circle, which includes Dr. Dre and 50 Cent, or artists signed to his burgeoning rap label, Shady Records, you won’t catch the Detroit spitter blowing out candles on his birthday cake and you won’t be able to sing him the refrain from his protégé 50’s legendary single, “In Da Club,” but you can take a look back at his numerous accomplishments since his last born day. There have been no media blow ups or surprise guest appearances on shows like HBO’s “Entourage” this year — just a steady flow of executive moves behind the scenes and a few guest spots on selected tracks that came off as lyrical cherries on top. To kick off his days as a 39-year old MC, Eminem was tapped by GQ magazine as one of their “God Of Rock” picks along with fellow rapper Lil Wayne and rock legend Keith Richards. Em followed that up with an animated guest appearance at 50 Cent’s SXSW set, and then he got back to producing and mixing Slaughterhouse’s debut album, Welcome to: Our House. In May, Em helped 50 Cent to recover from a quick hospital visit with some encouraging words. “Yo Fif, you were shot nine times man. If you die over a burger, this sh– ain’t gonna go right. People ain’t gonna be feelin’ this,” Fif told MTV News, relaying his mentor’s message. A few months later, the partners-in-crime appeared together in the Adrian Grenier-produced documentary “How To Make Money Selling Drugs,” which debuted at the Toronto Film Festival in September. 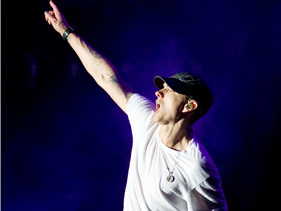 To cap off his year, Marshall covered Vibe magazine to commemorate the 10th anniversary of the movie, “8 Mile,” a semi-autobiographical film that showed the rapper’s acting chops, depicting a struggling rapper in Detroit balancing a dysfunctional home and his dreams of making it big in the rap game.